Logon — When the administrator logged into the Management Portal. Policy — Any policies created, changed, or deleted. Agent Commands — Any commands that were initiated. Override — Any overrides created, changed, or deleted. Group — Any groups created, changed, or deleted. Endpoint — Any endpoints renamed or moved to another group. Reports — Any reports generated. 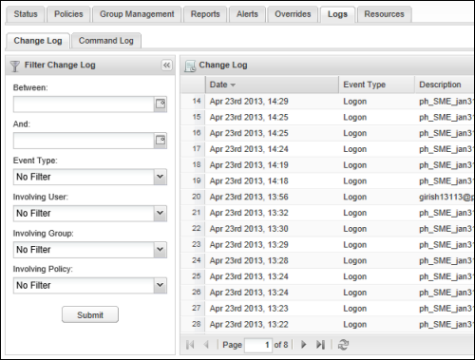 You can filter the Change Log by date range, event type, user, group, and policy. The Change Log displays by default. It lists change events, and provides filters for narrowing the list. You can use the Filter Change Log options in the left panel to narrow the data. When you have selected the filtering criteria, click Submit. Between and And — In these two fields, enter the time frame in the mm/dd/yyyy format, or by clicking the calendar icons to choose dates. Event Type — From the drop-down list, select an event. Events include changes in groups, endpoints, or policies, as well as overrides and user logons. Involving User — From the drop-down list, select a user. Involving Group — From the drop-down list, select a group. Involving Policy — From the drop-down list, select a policy. If the data exceeds 50 items, use the navigation buttons at the bottom to move between additional pages.